Situated in the Esperance region of WA, Esperance Quality Grain makes use of a number of silos, conveyor belts, bucket elevators, rotary distributors, drying ovens and a cleaning set-up to process grain and canola for external customers. The majority of grain produced in WA will be stored for a period of time, so to ensure it stores well without spoiling the grain may require cleaning and drying. The Esperance Quality Grain processing facility offers this service to many of the local producers in the area. 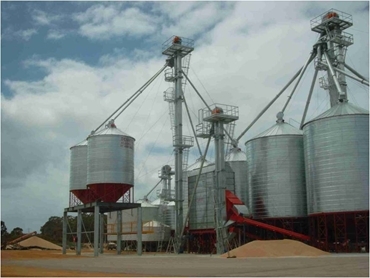 Aeration Control , a subsidiary of Industrial Automation, is set to design, supply and install a grain handling system for Esperance Quality Grain that includes a conveyor, elevator and silo control system for all their grain handling needs. This includes the design, supply and installation of a motor control centre control system PLC, operator interface panel and soft starter equipment. It also includes the supply and calibration of the grain temperature probes. Aeration Control is also responsible for the field mounted proximity switches for silo full indication and blocked chutes on rotary distributors. The Phase 1 grain handling system allows a user to control all conveyors and elevators from a touch screen on a centralised PLC operating system. Manual controls are also provided for conveyors for maintenance override purposes. Field mounted telemetry provides status monitoring and some control functionality, which will be reprogrammed within Phase II, with additional equipment to provide a fully automated system. The grain drying system has already been integrated into the control package with allowance being made for the integration of the cleaning control at a later date. two stage implementation, i.e. fully upgradeable system.